The term computer graphics may be defined as images created by computer software. Today, all commercial computers use graphics. A few seconds after you turn on your computer the screan shows icons ( small graphics ). There are two types of graphic software depending on how the image is computerized. They are bitmap and Vector graphics. A bitmap is a type of image file format used to store digital information ( images ). It can be defined as a map of bits ( an array of coloured dots ). The smallest piece of information in an image is called a ” pixel “. “The pixel is like the atom of a body” . They look like dots or rectangles. 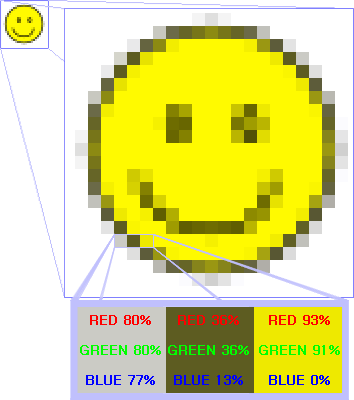 Each pixel has its own colour, defined, normally, by three bytes ( 1 byte = 8 bits); a byte for red, a byte for blue and a byte for green ( in a rgb system). Let’s see a example of a bit image. On the left, we take three pixels with different values in bytes. What do you think would be the colour byte for a black pixel? This describes the number of bits used to characterize the colour of a pixel unit in a bitmapped image. We may talk of bits per pixel ( bpp) for the number of bits in a pixel. The higher the bpp, the better the range of different colours. a) 1-bit colour = 2 colours. So white and black colour — a old monochrome picture. 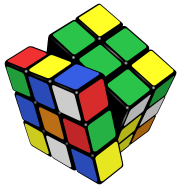 b) 3-bit colour (2³ = 8 colours). Images with only 8 colours, like in early home computers. c) 8 bits 8-bit colour (28 = 256 colours) Super VGA, etc. 8 bit colour image. In this case, we have just one colour but with a wide rage in terms of tonality. Every pixel is different and it is possible to find up to 256 different colours. Pixel resolution is the number of pixels per area. In general, an image X pixels high by Y pixels wide has a resolution of X x Y pixel. Other conventions include describing pixels per area unit, such as pixels per inch. The next image shows how different number of pixels per area or density resolution affects the image. If you want to draw a line of 10 metrer in a bitmap you need 1000 pixels per meter times 10, so 10.000 pixels ( for low resolutions ). So you need a lot of information ( bytes ) just to do the same thing over and over again, pixel after pixel. In a vector graphics program we give the starting point and the end point and the program does the rest. 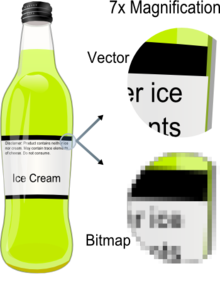 On the left, there is a bottle image made with a vector graphics program. Notice the different between bitmap and vector graphics. So, Vector graphics is the use of points, lines, curves, and polygons, which are based upon mathematical equations, to symbolize images in graphics programs. A good free software for vector graphics is inkscape. The GIF format supports animation. 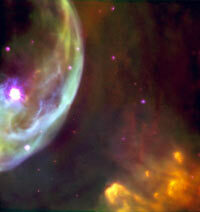 It also uses a lossless compression that is more effective when large areas have a single colour.